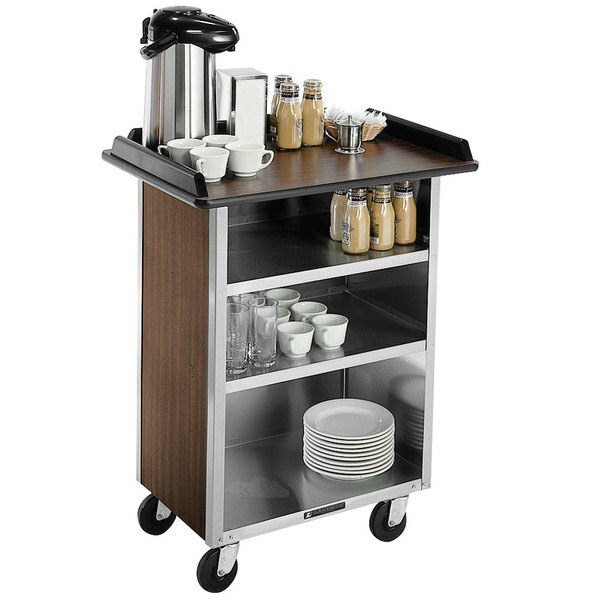 Lakeside 681 Stainless Steel Beverage Service Cart with 3 Shelves and Walnut Vinyl Finish - 58 3/8" x 24" x 38 1/4"
Boost beverage service efficiency for your catered event, small breakfast buffet, or hotel's room service with this Lakeside 681 stainless steel beverage service cart with 3 shelves and walnut vinyl finish! No matter the application, this cart effectively eliminates the need for a dedicated serving table by allowing you to load the cart with beverages, snacks, and other supplies before wheeling it out to the serving area for guests to enjoy. It even has 2" rails along the top's sides to prevent product from falling off. Additionally, it boasts 5" swivel casters for easy transportation. The cart's rugged stainless steel construction provides guaranteed durability, while the exterior's walnut vinyl finish gives it a subtle elegance that is sure to complement any decor. Thanks to this unit's waterproof laminate top, you even have peace of mind knowing that it is protected from the inevitable spills associated with any beverage service. This cart also features 3 interior shelves to provide you with discreet storage of extra supplies and service items to further enhance your operation's efficiency. Interior Shelves: 50" x 21"
Shelf Clearance (middle and top): 6 1/4"
Shelf Clearance (bottom): 12 1/4"
Lakeside 672 Stainless Steel Drop-Leaf Beverage Service Cart with 3 Shelves and Walnut Vinyl Finish - 33 1/8" x 21" x 38 1/4"
Lakeside 675 Stainless Steel Drop-Leaf Beverage Service Cart with 3 Shelves and Walnut Vinyl Finish - 44 1/4" x 24" x 38 1/4"
Lakeside 678 Stainless Steel Beverage Service Cart with 3 Shelves and Walnut Vinyl Finish - 40 3/4" x 24" x 38 1/4"
Lakeside 636 Stainless Steel Beverage Service Cart with 3 Shelves and Walnut Vinyl Finish - 30 1/4" x 21" x 38 1/4"
Lakeside 676 Stainless Steel Drop-Leaf Beverage Service Cart with 3 Shelves and Walnut Vinyl Finish - 61 3/4" x 24" x 38 1/4"